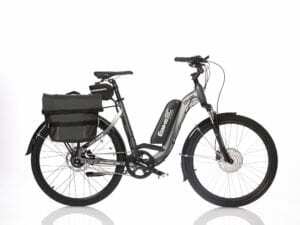 In order to have a better understanding of EbikeBC conversion kits features and specifications compared with other pioneer brands such as Bionx, Bocsh or Stromer electric bikes, we have selected certain product models of each and collected brochure information in bellow table chart. 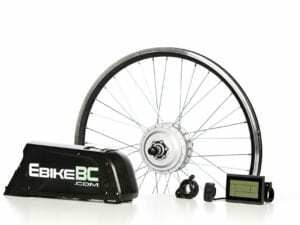 We have tried to standardize the test condition for all 4 brands as much as possible; however we are not responsible for collected information other than EbikeBC electric bike conversion kits performance test results. 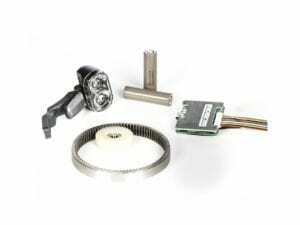 * To compare the convesrion and ebikes together we assume that the kits are installed on a 800CA$ value bicycle. Many parameters affect the travel range per single charge on ebikes. Rider’s weight, bike type and tires, tire pressure, road surface, road grades, ride cycles (no of stops, acceleration/declaration), speed, wind against, cargo or trailer, level of assist and pedaling effort from the rider. The rider’s weight is assumed to be 80kg average. You can approximately add/subtract 1% to/from the range by any 2% decrease/increase of the rider and/or cargo total weight. Using ebike in lowest level of pedal assist will increase the range up to double the average city range in highest level. Range for 350W system using 8.8Ah is almost equivalent to 500W system using 10.4Ah. Range for 500W system using 10.4Ah is almost equivalent to 500W system using 13Ah. Range in no stop constant speed flat route is more than double the city traffic. Range in no stop constant speed flat route is almost 25% more than no stop constant speed 5% grade route for a round trip. As an example the range for a 2.1 thick mountain bike tire with 35psi inflation is 30% more than the same tire with 20psi. Trikes and four-wheelers might have 10-20% less range for more road resistance.